APPEARANCE: Yasha are a race of powerful, high ranking nature spirits which appear in Buddhist cosmology. 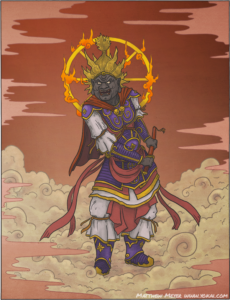 They are a type of kijin, or demon god–both worshiped as benevolent gods and feared as wrathful demons. They are fearsome warriors, and serve as guardians of the treasures of the earth. They have varied forms, but generally are humanoid in appearance, with brightly colored skin, spiked hair, sharp teeth, and fierce eyes. They are usually depicted carrying weapons and wearing ornate armor. BEHAVIOR: Yasha are one of the members of the the Eight Legions–eight supernatural races who listened to the sermons of Shaka Nyōrai and converted to Buddhism. Along with the ten, tatsu, kendatsuba, ashura, karura, kinnara, and magoraka, they serve as guardians of the Buddhist teachings. Yasha serve Buddhism in a number of ways. Most importantly, the Twelve Heavenly Generals (the twelve most fearsome yasha), serve as the personal bodyguards of Yakushi Nyōrai, the buddha of medicine. They wage war on sickness and fight the enemies of Buddhism. They are also important in astrology–as there are twelve of them, they are associated with the twelve animals of the Chinese zodiac, the hours of the day, the months, and the directions. 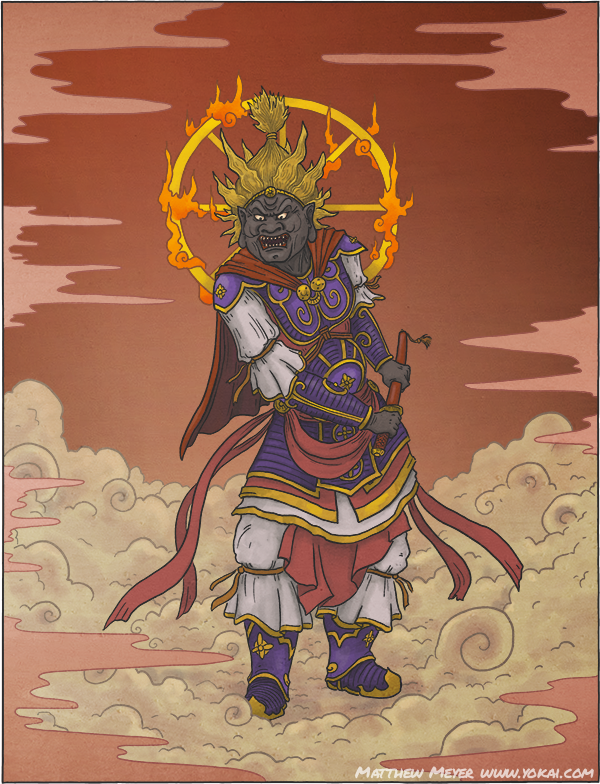 Their leader, General Kubira, is also an important kami in the Shinto faith. He is believed to be the manifestation of Konpira, a god of fishing, seafaring, and farming. He is enshrined as Ōmononushi in the Kotohira shrine of Kagawa Prefecture, alongside Sutoku Tennō. Yasha, along with another kind of demon called rasetsu, are used as soldiers in the armies of Bishamonten, one of the Four Heavenly Kings. Bishamonten is often depicted trampling a tiny, evil yasha (called a jaki or amanojaku) under his feet. His armor is also often decorated with scowling yasha faces. In this way yasha also serve as a symbol the triumph of virtue over wickedness. ORIGIN: Yasha come from Hindu mythology. They were originally benevolent nature spirits and caretakers of the trees and earth. In Buddhism, they were interpreted as evil, ghost-like spirits who preyed upon travelers, but later gave up their wicked ways upon hearing the sermons of the Buddha. 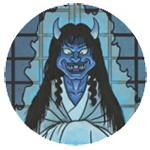 The Buddhist version of yasha is very similar to another class of Hindu spirits: the ogrish, man-eating demons known as rasetsu. When Buddhism was brought into China, it mixed with Chinese folk religion and astrology, and yasha grew even further away from their Hindu origins. When Buddhism was brought to Japan from China, the Chinese interpretation of yasha was brought along with it. In Japan, yasha were often viewed as Buddhist manifestations of local evil spirits, like amanojaku and oni. Yasha took on some of the characteristics of these spirits, and sometimes even became synonymous with them.